We call Elizabeth a classic and take it for granted that she’s always been found in that graceful form. 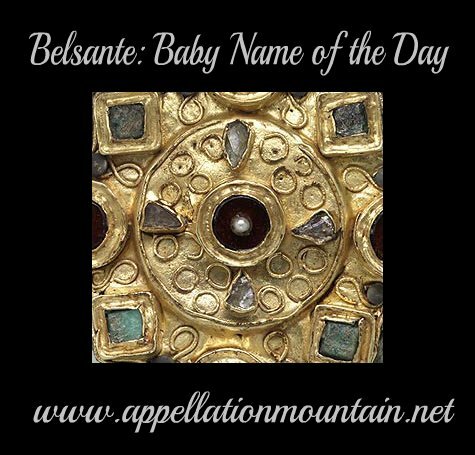 Thanks to Rachel and Shelby for suggesting Belsante as our Baby Name of the Day. First, let me confess: I haven’t a clue how to pronounce this one. I’m saying bel SAHNT, but it could just as easily be bel sahn TAY or bel SONT or some other variation. There are two competing theories as to her origin. First, Belsante could be related to Elizabeth. While we tend to think of Elizabeth as the classic and enduring form, that precise spelling is actually a latecomer. The original Greek was Elisavet and the Hebrew Elisheva. Isabel was once more common in English, and Isabella in romance languages, probably thanks to the Provençal form Elisabel. It would take the first Queen Elizabeth of England to cement this version of the name as a classic in the Western world. Variant forms abounded before – and after – her reign. Some of them played off of the -bel ending: Sabeline, Isabelot, Isabeau, Besseta. Other names use -sant, -sent, and -senda as diminutives: Helisent is probably short for Helen, and Elisenda was bestowed as a given name in medieval Spain. So it tracks the Belsante could have evolved from Elizabeth and company. But there’s another possibility, for which I’m indebted to Elea at British Baby Names. 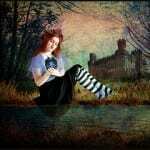 She suggests that Belsante is related to the German name Belissendis, via the forms Belisent and Belisant. Elea’s theory works well. She also points out that Belisent is the name given to Charlemagne’s daughter in Old French tales, and it is the name of another figure in Arthurian legend. Did Charlemagne have a daughter named Belisent? Maybe. We know that he had at least seventeen children. But few of his daughters names’ are recorded for history. Two are known: Rotrude and Bertrada. Charlemagne occasionally negotiated marriage for one of his daughters, but never completed any of the matches. This makes it difficult to trace his family tree with any confidence. 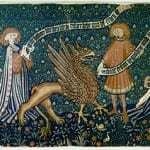 So is Belsante a cousin of Elizabeth, or a Germanic rarity? She could be both. Just as Jennie started out as a nickname for Joanna, but caught fire once we embraced Jennifer, names merge and shift over the years. Surnames like Belson are often considered metronymics – surnames derived from the mother’s name. Belson means “son of Isabel.” Forms like Belleson and Belesent are recorded from the 1100s into the 1300s, as surnames evolved. Many Norman names were Germanic in origin, softened by French, specifically the Northern French spoken by William the Conqueror and his fellow invaders. If they weren’t Germanic, they were borrowed from the Bible or from stories of popular saints. It makes it difficult to untangle Belsante’s origins with any confidence. Today she could be a rare gem worthy of discovery. We’re all about ends with -bel, -belle and -bella names, from Isabella to Annabel to rarities like Mirabelle. Names like Bellatrix and Bellamy put Bel- in the driver’s seat. With her intriguing history and the nickname Bella built in, this is one medieval appellation that could wear well in 2013. I like Belisent/Bellicent a lot actually. I feel (and maybe I’m just very odd) that Bellicent SOUNDS prettier and Belsante looks prettier written? I’m liking Belisent more than Belsante also – pronunciation and the written form actually. I love Elisabel and Elisenda even more than that, though. I also found Isabelot rather cool, for those of us who like over the top medieval names. Besseta, Helicent, Bellisendis – all names I don’t recall ever coming across. I think Elisabel, Elisenda, and Besseta are the most usable. Very interesting! I don’t think I’ve ever come across this one before. That was a really good idea – thanks for the addition! The Oxford Dictionary of Surnames give three origins! bel sahn tah, maybe, from the German? Pretty name, in any case. Part of me wants to translate this as “good saint”. Do you think the french “santé” (health) figures into this one? I think “good health” would be “bonne santé” rather than “belle santé,” but still…? It’s a nice name! I have such a soft spot for medieval names. This is a great one! Having studied some French my inclination is to pronounce it Bel-saunt not fully an O sound but almost there. Thanks, Abby! I do like it a lot…but may prefer the Belisent form. Wow~ love it! All the info, and the name.